Even in the middle of winter, sometimes I crave a smoothie. There’s something about the blend of fruits mixed with ice cream or milk that just really hits the spot when you feel like you need a hint of sweetness without too much sugar. There’s a smoothie shop on my way in to work, but their smallest size costs around $4.00. A more cost effective way to get delicious smoothies in the comfort of your own home is to try the new Yoplait Frozen Smoothies. 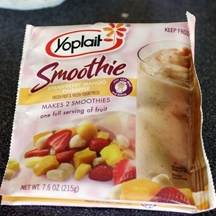 Found in the frozen fruit section, Yoplait Frozen Smoothies provide almost everything you need to make your own frozen smoothie. 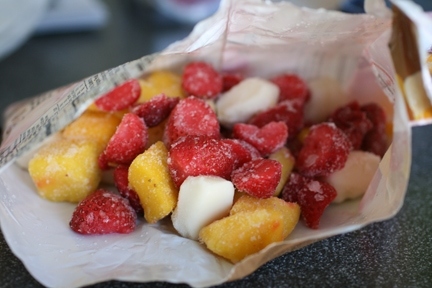 Each bag contains frozen fruit pieces as well as real Yoplait yogurt pieces that you simply add milk to and then blend. In the picture below, you can see the bag of Strawberry Mango Pineapple Yoplait Frozen Smoothie that I tried. You can clearly see the ripe fruit pieces and the yogurt pieces (the white ones that look like banana.) The other available smoothie flavors are Strawberry Banana and Triple Berry. 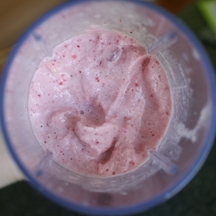 I decided to make my smoothie for a mid-afternoon snack before heading out to the mall. 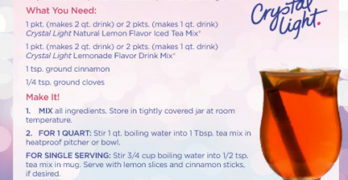 Preparation was very easy – throw in the fruit pieces, add milk, and hit blend. I suspect that the smoothness of your smoothie depends on how good your blender is, but I’m sure that the fact that all of the pieces seem to be individually flash frozen (as opposed to all clumped together) helps your blender blend everything efficiently. The blender I used was able to pulverize the smoothie in about 15 seconds – so fast that I kept checking and blending it because I couldn’t believe all of the pieces would blend so quickly. The Strawberry Mango Pineapple Yoplait Frozen Smoothie was the perfect blend of flavors for me, with the fruit being the most prominent flavor and the yogurt flavor being the subtle and tasty background. It wasn’t too icy or watered down like other smoothies that you make with ice. It tasted completely natural and healthy, which made me feel like I was being healthy drinking it (and given the ingredients, I guess I actually was.) It was one of those smoothies that you just keep wanting to drink as fast as you can, but you don’t because you don’t want to suffer from brain freeze. I finished my single serving in about 5 minutes. The Yoplait Smoothie is not a meal replacement, but it is a perfect and easy drink that you can prepare for breakfast, snacking, or for dessert. With real fruit and yogurt pieces I think this is a much healthier option than some of my other go-to snacks. 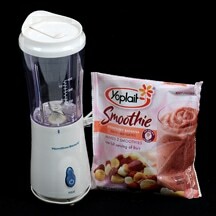 For more information about Yoplait Frozen Smoothies you can visit www.yoplait.com. If you would like to try out Yoplait Frozen Smoothies for yourself, then you can download this coupon to save $1.25 off one package of Yoplait Frozen Smoothies. My local Safeway had these on sale for $3.99, so that would bring the cost to about $2.75 for a package when you use the coupon. You can also enter to win the WCatDD Yoplait Frozen Smoothie Giveaway! One winner will receive a Yoplait Frozen Smoothie Gift Pack, which includes a coupon for a FREE Yoplait Frozen Smoothie and a blender to help you make your smoothies! THIS ENTRY IS REQUIRED FOR ALL OTHER ENTRIES TO BE VALID (+1): Tell me which flavor of Yoplait Frozen Smoothie you would like to try, or which flavors you think they should offer. ONE TIME BONUS: Vote for us for the Web’s Top Giveaway Blogs (+2). 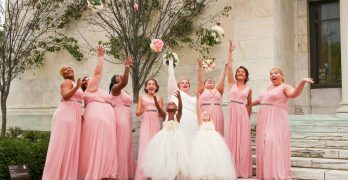 After voting, don’t forget to comment on this post as well for your chance to win $100 if we win! Giveaway ends at 11:59 PM EST, January 27, 2010. Disclaimer: This post consists of my (and/or fellow tester) opinions only. Your experiences may be different. No compensation was given for this review/giveaway. I did receive a free Yoplait Frozen Smoothie gift pack and information from Yoplait through MyBlogSpark to use and test for the purposes of this review. This did not affect the outcome of this review. I think I'd like a Strawberry Banana or Strawberry Kiwi.+1 I Tweeted: http://twitter.com/89linz/status/7987975250+1 I follow the blog through Google Friend Connect.+1 I follow on Twitter – 89linz+1 I'm a fan on Facebook.+1 I voted for your blog! I think I'd like a Strawberry Banana or Strawberry Kiwi. +1 I follow the blog through Google Friend Connect. +1 I'm a fan on Facebook. +1 I voted for your blog! I would like to see Dark Cherry added as a flavor- cherry yougurt is my favorite and I've made Cherry smoothies before, but a mix would be nice. I would love the Strawberry Banana and Triple Berry. I think that would like the Strawberry Banana. I know I'd like to try the Strawberry Banana Smoothie. Thanks for the link to the coupon I'll definitely use it. a lime smoothy sounds great! i want to try lime! I love pineapple so I would like to try the Strawberry Mango Pineapple. Thanks. This looks delicious and I would love to try it.